Every job, every installation, done right the first time. Isn't that what you'd expect from Arizona's leading AC repair and home services team? It’s never easy getting to the level where you are referred to by both customers and industry professionals as experts. But with more home maintenance services performed in the Gilbert area than any other local AC repair and service company, we’ve earned the privilege of the label. Our experience in heating and cooling services is unparalleled. And though that is easy to brag about, to our customers, the designation means that when emergency furnace or AC repair is needed in the Gilbert area, we can be relied upon to deliver the absolute best. 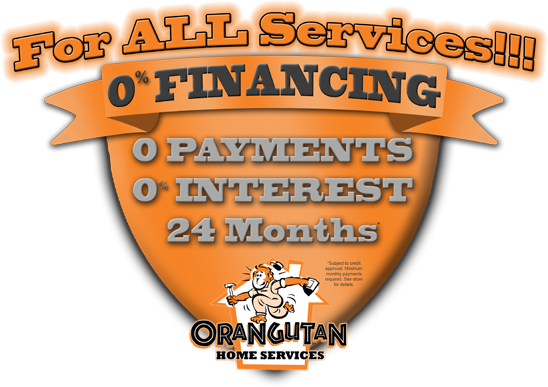 Our promises to our customers include prompt attention, knowledgeable and friendly technicians plus innovative techniques and equipment that are all backed by the Orangutan Home Services approach to stellar customer care. It really is true that we won’t be satisfied until you are beyond happy with your experience with us. Our aim has always been keenly focused on making the customer priority one; without you and your loyal support, we can’t do what we do. For Gilbert’s most comprehensive AC repair and other home services, including HVAC service/repair or installation, plumbing, insulation and other needs, call the experts at Orangutan Home Services at 602-892-9948. We serve Gilbert, Phoenix and beyond with the area’s Top-Rated Local® air conditioning and heating services.